Niebüll Public Library is situated right in the heart of the city near the "Rathausplatz" in the "Hauptstraße" (main street). At the left side you see a section of a map of the centre of Niebüll. Click on it for a larger image. 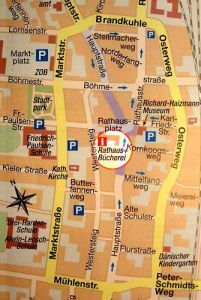 Further you´ll find a general map of Niebüll on the website of the city. » website of the City of Niebüll. If you´d like to visit us, no matter if by car, on bike or by walking, follow the traffic signs showing "Zentrum" (centre) and "Bücherei" (library).